When the Farmers Almanac uses words like “The Cold” and “The Wet” on their 2018 Winter Outlook map, you know the U.S is in for a wild winter. And while we hate to be the bearer of bad news, when winter is again predicted to be a beast, it’s necessary to be prepared. But even in trying to protect your home against the damages that come with frozen pipes, bursts happen. And that’s when you need to respond–and fast. While frozen pipes tend to be more common in older homes, the location of the pipe and the level of insulation surrounding it is really at the root cause. The other factor is, of course, temperature. When the mercury plummets to near record lows, water freezes. When this happens inside pipes, the frozen water expands, creating pressure that can lead to leaking or bursting. 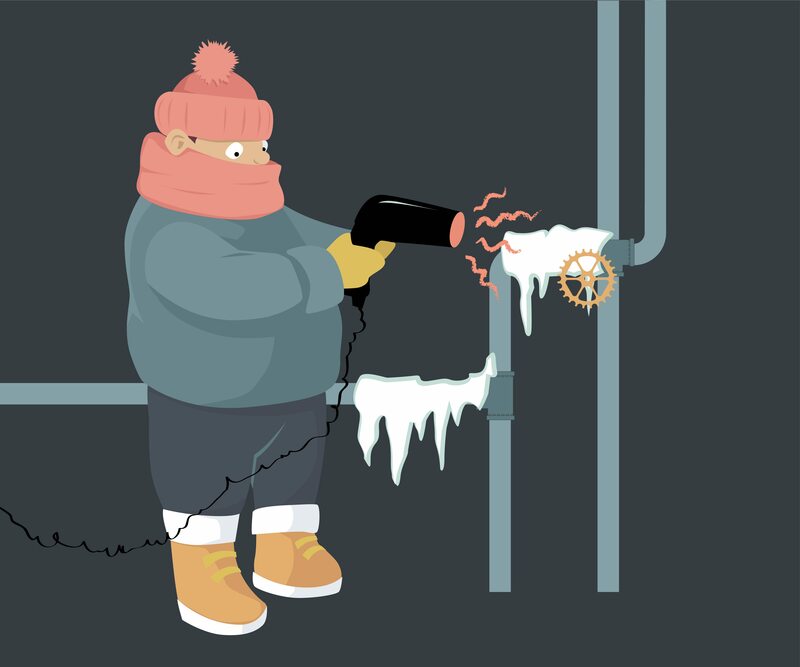 Frozen pipe prevention includes installing proper insulation and making sure the heat from your home keeps your pipes above freezing temperatures. If you’re not sure what to look for specifically, work with a professional plumber to address any concerns early, preferably before the cold season hits. Despite your best efforts–or maybe just best intentions–pipes freeze and burst. Now what? Shut off water: Immediately shut of the main water valve to your home to reduce the damage to the area. Power down: Water and electricity don’t mix. Avoid a shock by powering down and unplugging electrical devices in the area where the water has entered. If there is standing water, be sure to wear rubber insulated boots when walking through the area. Protect possessions: Remove belongings such as furniture, housewares, or clothing from the area to avoid excess damage to your possessions. Call a plumber: Contact a certified, trusted professional to help you respond to the burst pipe. If needed, look for one that offers 24-hour service if the burst happens at night or on the weekend. Contact a water damage restoration service: In the event your walls, ceilings or flooring are damaged by water, you may need to contact a water damage cleanup service, such as DRS, Disaster Restoration Services, to help remove the water, dry the air, and prevent mold and mildew from forming in your home. Remove the water: The longer excess water stands or remains in your home, the more damage it can do. Do your best to use towels, buckets, mops and wet/dry vacuums to remove the water. Run a dehumidifier: If not working with a water removal professional, it can be difficult to remove all the moisture from the interior of your home. In the closed room, run a dehumidifier to help dry the area out more quickly, being sure to empty the water tank on a regular basis. Contact your homeowners insurance company: Depending on your policy, water damage caused by burst frozen pipes may be covered. Contact your insurance company and file a claim to have damages assessed and necessary repairs and recovery actions reimbursed.